Portrait of Mithrapata, from his coinage. Mithrapata (circa 390-370 BC) was dynast of Lycia in the early 4th century BC, at a time when this part of Anatolia was subject to the Persian, or Achaemenid, Empire. Present-day knowledge of Lycia in the period of classical antiquity comes mostly from archaeology, in which this region is unusually rich. Believed to have been based at Antiphellus, Mithrapata is known to have competed for power with another man named Arttumpara. The name of Mithrapata, which is of Persian origin, is known from Lycian coins and also from inscriptions. During the fifth and fourth centuries B.C., the Lycian nobility was using Persian names, so Mithrapata may have been one of them. 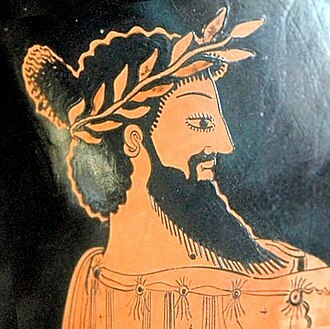 However, it has also been suggested that he may have been a Persian sent to rule Lycia by Artaxerxes II. Together with Perikle, Mithrapata was the last Lycia ruler to issue coinage. 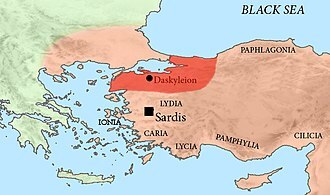 After 360 BC, the region of Lycia was taken over by the Carian dynast Mausolus. The portrait on the coins of Mithrapata, as for Perikle, do not show the dynast wearing the Achaemenid satrapal headdress anymore, which may suggest a level of independence from the Achaemenid Empire. ^ D. T. Potts, A Companion to the Archaeology of the Ancient Near East (2012), p. 912: "...c. 380–370 BC, two western Lycian dynasts named Arttumpara and Mithrapata claimed power simultaneously." 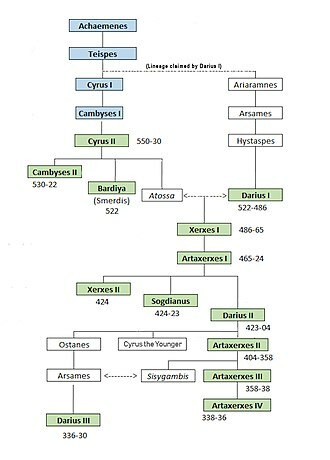 ^ CNG: DYNASTS of LYCIA. Mithrapata. 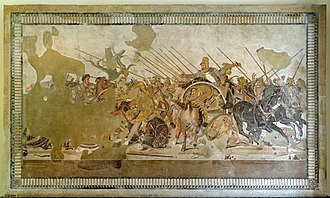 Circa 390-370 BC. AR Stater (23mm, 9.73 g, 5h). 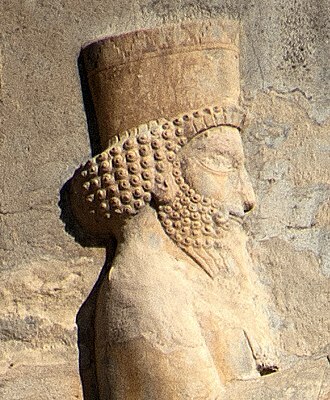 Tissaphernes was a Persian soldier and statesman. He was the grandson of Hydarnes, chithrafarna Shining Fortune, čiθra is from the Proto-Indo-European adjective koitrós bright, farnah is equivalent to Avestan xvarənah fortune, which appears as luminous. čiθra means nature, specifically the animate nature, the phrase čihr-farn means of glorious or splendid nature, or of radiant appearance. Tissaphernes was born in 445 BC and he belonged to an important Persian family, he was the grandson of Hydarnes, an eminent Persian general, who was the commander of the Immortals during the time of king Xerxes invasion of Greece. In 413 BC, Tissaphernes suppressed the rebellion of Pissuthnes and had him arrested, as a reward, Tissaphernes was appointed as satrap of Lydia and Caria, and commander in chief of the Persian army in Asia Minor. 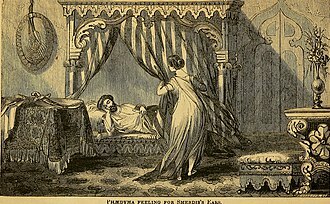 But Tissaphernes was unwilling to take action and tried to achieve his aim by astute, on the death of Darius II in 404 BC, Artaxerxes II was crowned king of Persia. 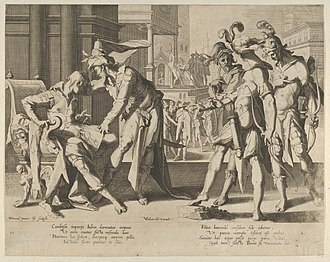 Tissaphernes, who found out about Cyrus the Youngers plan to assassinate his brother, informed the king about the conspiracy, but by the intercession of his mother Parysatis, Cyrus was pardoned and sent back to his satrapy. According to Plutarch, his resentment for him more eagerly desirous of the kingdom than before. With the desire for revenge, Cyrus gathered an army and pretended to prepare an expedition against the Pisidians. 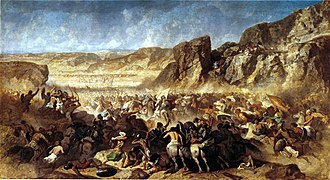 In the spring of 401 BC, Cyrus united all his forces into an army, which now included Xenophons Ten Thousand, by dexterous management and promises of large rewards, he overcame the misgivings of the Greek troops over the length and danger of the war. A Spartan fleet of 35 triremes sent to Cilicia opened the passes of the Amanus into Syria, Tissaphernes managed to warn Artaxerxes II and quickly gathered together an army. 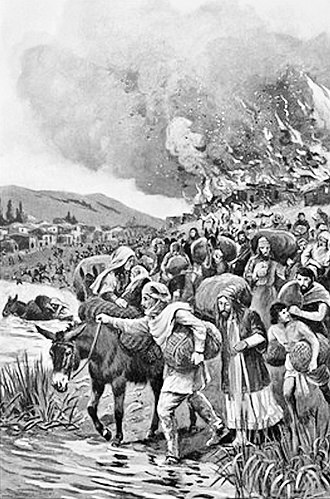 Cyrus advanced into Babylonia before he met with any opposition, in October 401 BC, the battle of Cunaxa ensued. Cyrus had 10,400 Greek hoplites,2,500 peltasts, Cyrus saw that the outcome depended on the fate of the king. 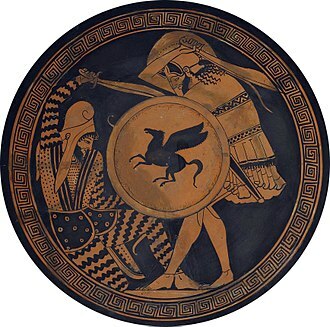 He therefore wanted Clearchus of Sparta, the commander of the Greeks, as a result, the left wing of the Persians under Tissaphernes was free to engage the rest of Cyrus forces. Mausolus, 377–353 BC. Casting from the Pushkin museum. 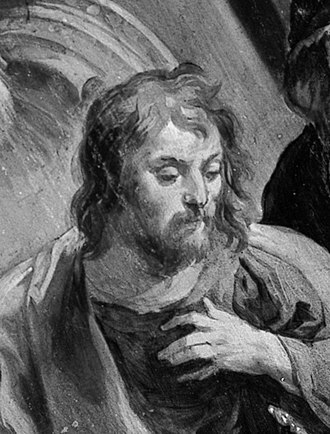 Oroetus attending the crucifixion of Polycrates (17th century painting, by Salvator Rosa). General Harpagus, behind Cyrus the Great (18th century tapestry). King Astyages places Harpagos in command of his army, by Jan Moy (1535-1550). Achaemenid Satrap Autophradates with visitors, on the Tomb of Payava, circa 375 BCE. 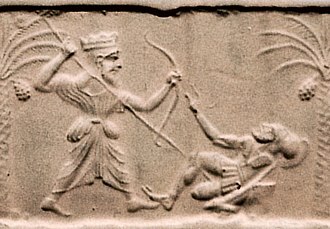 "Satrap Autophradates" is mentioned on the inscription on top of the frieze. Satrap Autophradates sitting for an audience, on the Tomb of Payava, circa 375 BCE. "Satrap Autophradates" is mentioned on the inscription above the frieze. Otanes son of Sisamnes, according to Peter Paul Rubens. 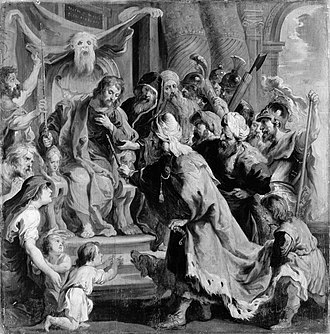 Cambyses II appointing Otanes as judge in place of his flayed father Sisamnes, after a painting by Peter Paul Rubens. The skin of his father appears above the seated Otanes. Otanes seated in the chair of the judge after his father was flayed (center). Portrait of Tiribazos wearing the Satrapal cap, from his coinage. 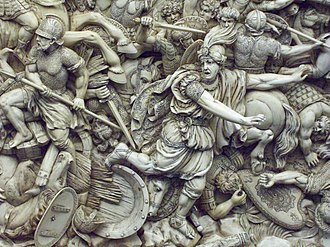 Spithridates attacking Alexander from behind at the Battle of Granicus. Charles le Brun (detail). 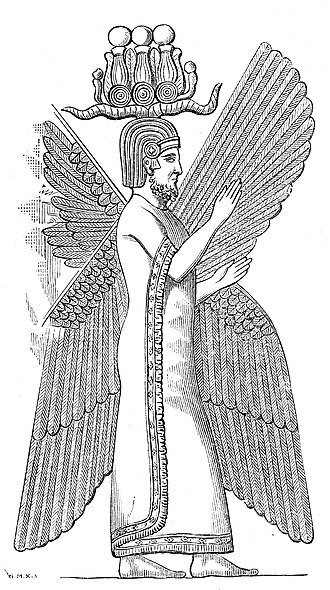 Portrait of Artumpara wearing the Achaemenid satrapal headdress, from his coinage. Anonymous portrait of a Satrap of Asia Minor, around the time of Pissuthnes. From a coin of Ionia, Phokaia, circa 478-387 BC.